There has been absolutely no crafting around here this week due to the death of my laptop. You wouldn’t necessarily think that you’d need a laptop to knit or sew but apparently I’m incapable of doing either without one! 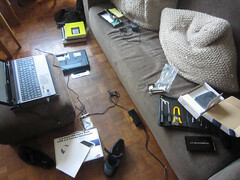 disassembling the old laptop to get the disk drive out so that I could transfer all my data to the new one. Before anyone suggests it, I do backup to an external disk but it turns out that my backup software wasn’t being entirely honest about which files it had backed up so there was quite a lot missing. By way of consolation, the new laptop is much better than the old one in just about every way so everything is running significantly faster. I think I’ve managed to get all the software that I use re-installed and all the data that I need copied over so everything should now be back to normal and I can get on with the crafting! 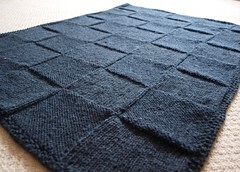 So, I ordered a blocking kit from I Knit, finished (yet another) shawl and set to blocking. Initially, it seemed that the wires weren’t going to make things much quicker; feeding them into the edges of the shawl seemed to take quite a while. What was much quicker was adjusting the shawl to the size and shape that I wanted. In the past, I would pin most of the shawl out and then adjusting anything would mean moving lots of pins. Being able to just tug the wires out slightly and replace two or three pins was so much easier. 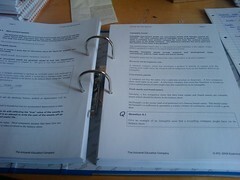 It also took far less time to get the edges suitably straight, something I always struggled with before. In short, I think I like them. I’m sure that the inserting of the wires will get easier with experience and the easier adjustment should mean that I get better results as I’m less likely to settle for “straight enough”. My trusty digital point and shoot camera died some time ago and, while we have a great digital SLR, I always felt like using it was too much effort for simple things like blog pictures and updating Ravelry. 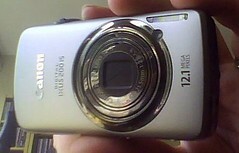 Having the SLR also meant that I didn’t feel like I should buy a new point and shoot because, well, we already had a camera. As well as that, I’m very fussy about my cameras which roughly translates to “it’s nearly impossible to find one that meets my arbitrary and sometimes contradictory criteria”. I do love Canon cameras though so when I spotted this one being sold “ex-display” in the John Lewis sale, it only took a couple of hours of pondering to actually decide to buy it. I’m glad I did though because I love it. It’s small and neat and easy to carry around with me but is also surprisingly powerful and has the functionality that I was looking for. Expect to see the output of both the camera and the blocking wires in future! One of the first things I did with the sewing machine was to empty the drawers and sort the contents into sewing machine parts and everything else. 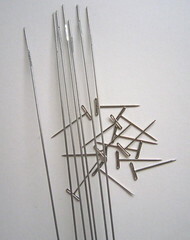 The first picture below shows what I first thought were all the sewing machine related parts (not including bobbins, screwdrivers, needles and the lint brush since those didn’t require any research to identify). My next task was to work out what each of these was. Two things made this reasonably straightforward. Firstly, the sewing machine came with its manual, which has pictures of most of the parts in use. 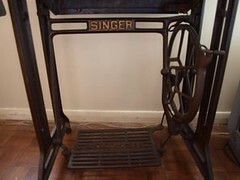 Secondly, this is a Singer machine. All Singer parts are stamped with “Simanco” and the serial number of the part. A quick trip to Google to search for serial numbers and most of the rest were identified. 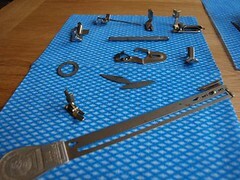 The harder part is going to be working out how to use them! Below is a full inventory of the attachments I have with pictures and serial numbers in case this helps anyone else trying to identify parts. 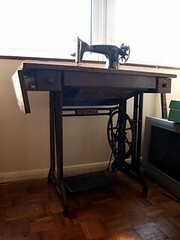 A 1940s Model 15K Singer treadle sewing machine and treadle table in what appeared to be almost working order. And, yes, that is our lounge that it’s now sitting in. 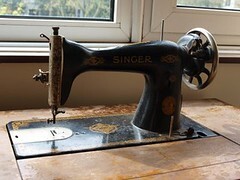 The advantage of buying a Singer machine is that there is a lot of information out there on how to identify and date them. Looking up the serial number of our machine on the Singer website, I identified the type and learned that it was one of a batch of 300,000 built in Clydebank, Scotland between November 1945 and August 1946. In fact, I spent almost the entire evening reading about the history of the Singer Manufacturing Company and the factory in Clydebank. I love the detailing and aesthetic of these machines and have been admiring them from afar for years. It’s so pretty that we decided it would look great as a piece of furniture even if we never got it working, although both of us thought we’d like to see it sew something at least once. However, the more I read about these machines and how good they are for sewing and, in particular, quilting, the more tempted I am to get it fully set up and learn how to use it properly. I don’t think it will be too difficult (famous last words!) to get it working properly again. The machine needs a new belt (already ordered), a good clean and some oil, and the woodwork needs some restoration. The ironwork just needs cleaned. The worst part is going to be removing all the dead spiders from the inside. 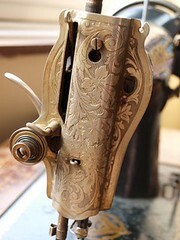 The other advantage of getting it working is that it came with a wide range of different attachments for hemming, quilting, and attaching cord and bindings that would cost me a fortune to buy for my electric machine. More details of those and the other contents of the table drawers to come in my next post. I’m not very good at self-promotion. It’s been suggested to me in the past that Scots can be “a bit backwards about coming forwards” and, while I wouldn’t like to comment on the general application of the statement, it describes me to a tee. However, the whole point of publishing things is to share them with other people and, in a previous post, I promised to share all my publishing news so here’s the full run-down of what I’ve been up to publishing-wise and a sneak preview of what is to come. There’s been both self-publishing and non-self-publishing so let’s start with the stuff that other people have published. In the other post, I talked about Theresa, which was actually the second pattern that I had published in The Fibertarian; the first was my Stylish Squares blanket in their Winter 2009 edition. This was my first ever published-by-someone-who-wasn’t-me pattern and both the submission process and the publication were more than a little nerve-wracking but so exciting that I was determined to do it again, which I promptly did in their Spring 2010 edition. Yellow Ginger Designs will have all my self-published knitting patterns as well as sewing and other craft projects. At the moment, it’s mostly knitting patterns but I have some sewing projects and craft tutorials that just need some decent photographs before they can go up. Everything is free at the moment, but I do plan on adding a “for sale” section in future. Everything that is currently free will remain free and there will continue to be free content added. I’ll continue to blog about craft stuff in general on this blog but any patterns or tutorials will be published over there. I will probably mention here when I’ve updated the other site but I can guarantee that, given my dislike of promotion, this blog won’t be turning into a constant stream of advertising! I am an enormous geek but, even for me, this was an unbelievably geeky weekend. Steven and I took a trip out to Bletchley Park on Saturday. 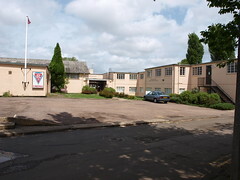 During World War II, Bletchley Park was home to the codebreakers working to crack the Axis codes, including the famous Enigma. Today, it bills itself as the National Code Centre and has an amazing collection of cypher devices and memorabilia from war-time actitivities there. 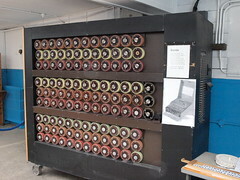 The most impressive exhibits though are the rebuilt bombes, which were the electromechanical devices used to decipher Enigma messages and the rebuilt Colossus, the first programmable electronic computing device. 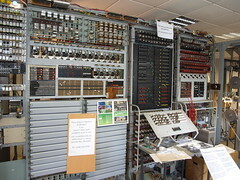 As well as all of this, Bletchley Park is also the site of the National Museum of Computing. The museum showcases the history of computing from the war-time code-breaking activities at Bletchley Park, all the way through to modern day. If you have any nostalgia for older computer systems, you’ll feel right at home here. The collection includes lots of things that you’d expect, like the Apple Lisa and the Spectrum ZX-81, and some things you might not expect, like the control system for a nuclear power station, installed in the 1960’s and in constant operation until it was decommissioned in 2004. Both museums feel very much like works-in-progress; there appear to be nearly as many workshops as exhibits but the sheer love and enthusiasm of the people behind them more than make up for any lack of polish. Audiobooks are my new favourite things and there is almost nowhere that I won’t listen to them. I listen while commuting, on long car journeys, sitting at home knitting, in the bath or lying in bed waiting to fall asleep. Although I only recommend the last if you are already familiar with the plot! It turns out that I’m a lot fussier about my audiobooks than I am about books that I read to myself though. I’m less forgiving of bad plots when I listen to them and I’m absolutely unforgiving when it comes to bad narrators. A good narrator is an absolute must and, for me, there are two qualities that make a good narrator. 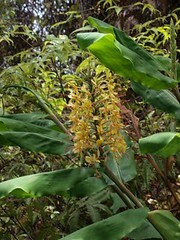 I’m posting this from my new G1 phone (mainly just to see if it’s possible). The phone was an impulse buy at the weekend, although I’ve wanted an internet phone for ages. Much as Steven loves his iPhone, the fact that you need a computer running iTunes was a huge turn-off for me since I would have had to sync it via Steven’s Mac. Enter the G1, described to me by probably the geekiest friend I have as “the ultimate geek toy”. So far, it’s living up to its reputation. I can surf, check email, blog and post photos without any trouble. Its slide out keyboard and slightly rubbery feel and smell remind me a lot of a Psion PDA that I had years ago, which is nice. I’m currently working on getting it set up so that I can read ebooks on it but that’s about the only thing missing at the moment. The photo (taken with the G1 phone) shows what I was supposed to be studying today had I not been playing with my new toy! Apologies to everyone who subscribes to the RSS feed for this blog and was recently spammed with what appeared to be 90-odd new posts only to discover that they were actually old posts. Also, apologies to anyone whose links were broken by the recent disappearance and re-appearance of this blog. The 10-year old PC running our webserver died last week and, true to my usual nature, I managed to make things a lot worse before I managed to make them better. (Trying to recover files from a dead server should not result in having to re-install the operating system on your desktop PC but somehow I managed it that way.) Also true to form, there were no backups to recover from and it was only after recovering most of the blog via cached versions from internet search engines that I discovered that I probably could get the files off the dead server. Sometimes it is just better to pay people to do this sort of stuff for you. So, everything is now back up and running, although not quite exactly the way it was so I’m afraid any old links are probably still broken. Normal posting should resume shortly with lots of knitting project updates to come! Apparently this fortnight has been about finding things that you can’t do without iTunes. First, there was “download stuff from Audible”, now the list includes “buy an iPhone”. Well, technically you can buy an iPhone but since the first thing it asks you to do when you switch it on is connect it to iTunes there’s not much point to doing the first bit. Somehow things didn’t seem so bad when software either ran on Windows or Mac or Linux but rarely ran on more than one of them. Now that there’s software that runs on both Windows and Mac, as a Linux user, I’m starting to feel like I’m on the outside looking in. And, amazing as it may sound, I’m not one of those Linux users who runs it just so they can feel that way. I don’t run Linux so that I can look down on other people who have never heard of an init.d file or a kernel. I run it because I don’t have to pay for it, it runs on the old and not very powerful hardware that I have and, until recently, it did everything I needed it to do. Now, it turns out that I have various options if I do want to buy an iPhone. I can use iTunes on Steven’s iMac to do the initial setup, much like I used it to download my Audible purchase, or, I can install and run WINE on my PC long enough for my PC to pretend that it’s running Windows, install iTunes and initialise the phone. Then I can hack the phone so that it can synchronise with an application that will run on Linux. But, frankly, I just don’t want to. What I want is to buy the phone and use it without having to jump through any hoops (why do you need a computer to use a mobile phone anyway?). So, until I get over this bout of childish petulance, I won’t be buying an iPhone. I’ll just need to live vicariously through Steven’s instead.